There is a small car park attached to Denton Burn library, accessible from the westbound carriageway of the A186 (West Road). As ever, be aware that there are car thieves operating, as there are at all of the car parks along the Wall. Stout footwear is almost certainly unnecessary. 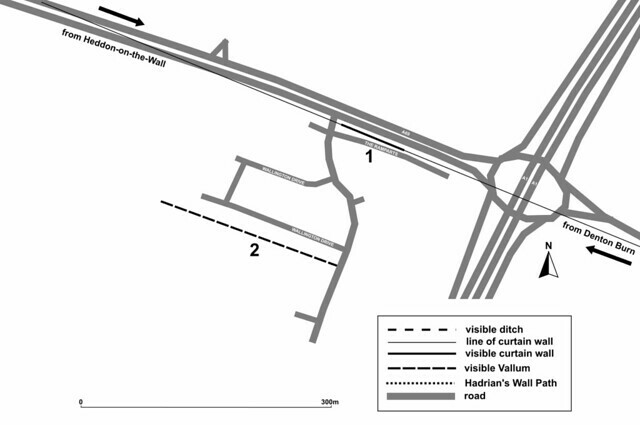 Immediately next to the car park is a short length of curtain wall (1). 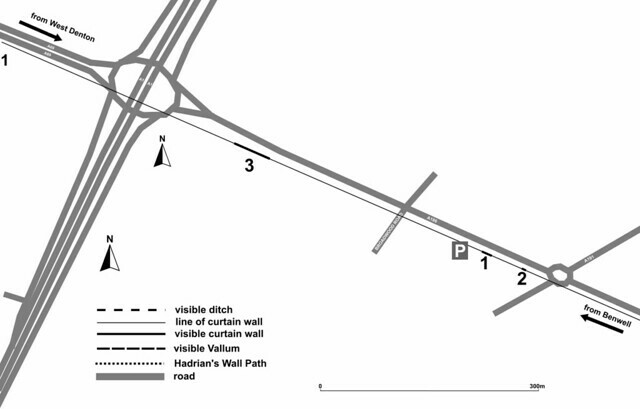 Continuing eastwards towards the roundabout reveals the smallest of all the consolidated lengths of curtain wall (2) belonging to Hadrian’s Wall (on the forecourt of the petrol station). Heading west and using the pedestrian crossing to negotiate Broadwood Road ultimately leads to the length of curtain wall and turret (3) at Denton Hall. As at Heddon-on-the-Wall, there is no actual formal car park of any size at West Denton. There is, however, a large sprawling estate where street parking is available for the couple of things you can see here. Much depends where you park as to how the monuments are zoned, so we’ll just assume you are within easy reach of your two main targets. Between the westbound carriageway of the A69, on the western side of the huge junction with the A1 western bypass, and the the road called The Ramparts (see what they did there?) there is a short length of curtain wall (1) visible on the verge. To the south of this, within the housing estate, running parallel with Wallington Drive, there is a large, open green area which is in fact a section of the Vallum (2); smoothed out by time (and agriculture), it is nevertheless instantly recognisable.